Use in conjunction with an Enolmatic filler to filter wine inline as you are bottling. 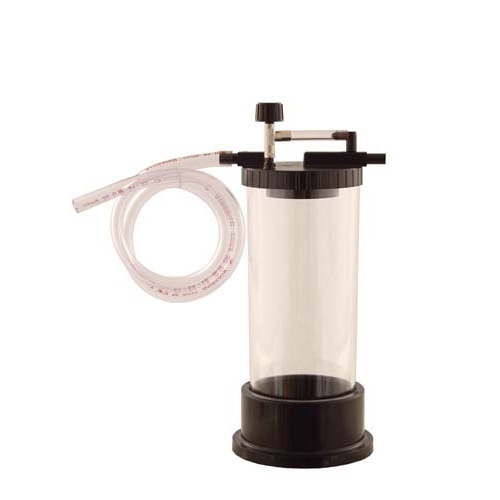 Saves time by eliminating a separate step and allows you to filter without using a pump or exposing your wine to oxygen. This filter unit is placed inline between the product and the filler itself. Filters are available in 5, 1 and .5 micron ratings. The filter cartridges used with this housing can be cleaned and re-sanitized for future useage. Wash by running PBW (CL25) followed by a hot then a cold rinse. Re-sanitize immediately after washing and then again just prior to the next use with SaniClean (CL27). This is supposedly a .5 micron filter. Much closer to 1 or 1.5 microns, so that's a negative. It's impossible to clean satisfactorily, and that's a major attraction to buying it. Finally, at this price, with the two major issues described above, you would be better served to use disposable filters or buy a couple of the stainless filters sold on this website. There are no special connections for this filter unit so there is just no compelling reason to spend $180 on it.